Improve load stability during transit with our range of Ball Baffles. Whether it’s water, diesel or any other compatible liquids, Ball Baffles reduce fluid movement for a low liquid displacement. They also significantly reduce mechanical tear and wear by reducing the effect of liquid surge. In the long run, our Ball Baffles will prevent you from having to regularly buy replacements. 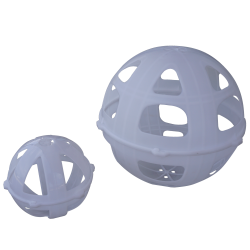 Our Ball Baffles are also easy to install, so there’s no need to hire someone to do it for you. Regardless of what type of tank you’re using, our Ball Baffles can be used for a variety of tank materials, including fiberglass, steel, and poly. Browse through our range of Ball Baffles below. If you’re still not sure on which product you need, don’t hesitate to contact us. We’re more than happy to help all of our customers out.